TULSA -- A family is still recovering nearly two months after a massive fire took over her home. 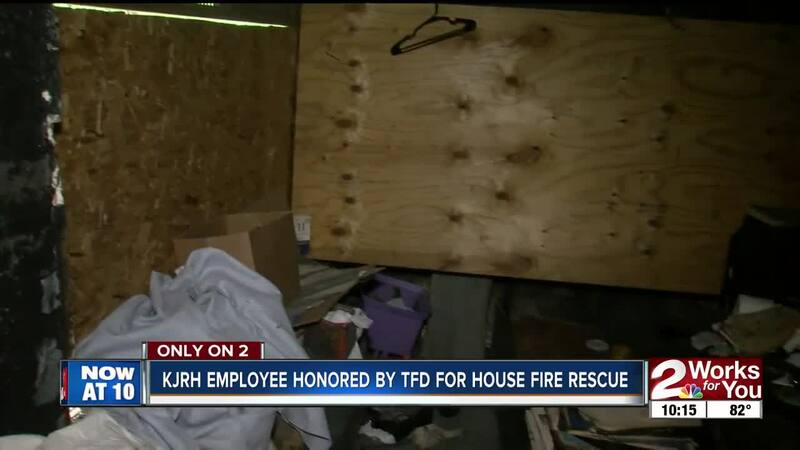 On Friday, the man who pulled a grandmother out of her burning house was honored by the Tulsa Fire Department. When firefighters arrived at the home, the lady had already been removed from her home by the neighbor across the street. The neighbor was 2 Works for You executive producer Garrett Weindorf. In April, he pulled the woman out of the burning home and helped her daughter and teen granddaughter to safety. "That was unbelievable what he did, because the amount of fire that was present was unsurvivable," Tulsa firefighter Dallas Duncan said. The house is unrecognizable now. On Friday, Weindorf returned to see what's left. Leta Bennett, one of the house fire victims, said she was in the room where the flames started. "I woke up and I was sleeping on the couch over here, and it was coming up out of the furnace," Bennett said. "I walked over and it's climbing up the wall and climbing even further." She thought she had the fire out and turned to her daughter and elderly mother. That's when Weindorf spotted the flames and rushed into the home. "To have someone like that as a neighbor and citizen of Tulsa, I mean it speaks volumes of the person he is," Duncan said. "I'm very grateful he was here," Bennett said. Bennett said looters have now started stealing what's left inside the home. Click here to visit the GoFundMe page for the victims.